We're all going on a .... Actually, we're not. But I'm now on holiday for five weeks (bar a few hours when I'm going in for specific meetings), so it's pouring rain, of course. Still, I've got lots to occupy myself. 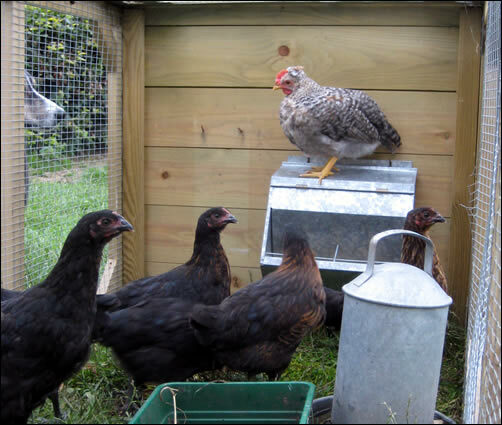 I've decided to offer a couple of "Backyard Poultry Keeping" courses in July and August, with maybe a third in September. I've done some posters and I'm going to contact the local rags on Monday - hopefully they will be desperate for copy, since the Council is in recess! I kind of know the format I'm going to follow but I need to firm up on that. There are a few other things I need to chase up as well. Today's news from the madhouse! It's been a mixed bag, weatherwise. We had heavy rain this morning, changing to dizzle in the afternoon; now it's bright and dry but cloudy. It's very warm though - good weed weather. We've done a fair bit of weeding today - in the peas and beans, the beetroot and the carrots. The beans are woeful - last year we could have contracted with Tesco. This year we've got about 5 plants out of 16 sown. I stuck the last of them in the ground today in a forlorn hope that they might grow. The double row of peas that were direct sown aren't doing much either - the ones started in the guttering are covered in flowers and peas - you can see where this is going, can't you? Read more on Today's news from the madhouse! Tess is lame. I have a horrible feeling that she might have a problem with the cruciate ligament in her left leg - she ruptured the right one earlier in the year and had surgery to repair it. She can't / won't put any weight on it, although she's eating and doesn't seem in pain. I'll get her to the vet tomorrow. Both dogs were at the vet for their annual check and booster on Friday, along with Cass, who had a lump on his back a couple of weeks ago and was going back for a final check. He's been a bit sneezy, so the vet had a look at his mouth, where he had a tooth removed a couple of years ago. It was a bit inflamed, so he's got antibiotics and an anti-inflammatory - we should have shares in "Metacam". She thinks there may be a tumour on the bone, but "Metacam" may have a retarding effect on it, so I suspect he'll be on it for the rest of him life. Other than that, he's in the pink, so we'll just have to wait and see. I've said here before that if I could only grow one fruit, it would be raspberries - and now it's raspberry picking time, I haven't changed my mind. I was on picking duty yesterday evening - it's really Dan's job but he was away on business- the sun was shining, the raspberries were plump and tasty, the ones damaged by birds were being shared with the hens, who were chooking about my feet, and all was right with the world. Once I'd finished, I made a few pounds of raspberry jam. Now, my record with raspberry jam is not one to be proud of. Last year, I think I over boiled it (because I was too impatient to let it cool enough to check the set properly) so the jam is like toffee - tasty, but a real jaw breaker. This time, I stuck to the recipe and waited for a bit longer to check the set and it was OK first time. The result - jam-textured jam!! It will still give you dental caries, but it will leave existing filling in your mouth! From previous entries, you will know that we have a broody hen, rather unexpectedly. We have no cockerel at the moment, so I bought 12 eggs - 6 RIR and 6 Cuckoo Maran; just in case she got fed up, I put four (plus the ones of ours she'd already hijacked) under her and the remaining eight in the incubator. They were due to hatch on Friday. I noticed last week that the temperature in the incubator was low, so wasn't at all hopful of getting any chicks - Dan candled them and said two looked like they were full of chick. We had our first tomatoes yesterday - a few little "Sungold". Delicious! Our broody hen and her small family seem to be fine. The weather here was overcast and cool this morning, but at about 10am, the cloud cleared and it is now a lovely warm, sunny day. I checked on them both this morning Broody refused to stay out of the nest - if I shut her out, she was terribly agitated, so I decided to go with the flow. As a mother who quite often has no idea what she's doing, I projected my fears on to Broody. However, her maternal instinct seems to be in good working order. She and chick have been out in the sun since it came out. Chick is pecking away at chick crumbs, with mum, and toddling about (he's not very good on his feet yet). Here is a recent photo of Chip, our sole Cream Legbar. I'm pretty sure he's a boy. He has a head for heights - I've found him perched on top of the water container yesterday and here he is on top of the feeder. You can see his little harem, and Meg, gazing up at him in awe and admiration! Chocolate Eggs - and it's not even Easter! Six Chocolate Orpington hatching eggs sold on eBay today for £250 (Two hundred and fifty pounds - just in case you think I've misplaced the decimal point). Apparently, a pullet sold for £250 and a cockerel for £500 this year. They are stunning hens IMHO, but I wouldn't pay that for a REAL chocolate egg! I bought 12 Cream Legbar eggs - and am committed to following the incubator instructions to the letter. I fear I have been rather complacent with the last two batches, which probably explains the poor hatch rate. Must do better! Read more on Chocolate Eggs - and it's not even Easter! We don't normally name our chickens - the closest we've got previously was "Mrs Green", Mrs Red" according to the leg rings. Now we have Blanche. Blanche is a Black Rock with distinctive white "earrings" - she's quite young and was in the batch of Black Rocks I bought at Stirling a couple of months ago. Actually, I'm not sure BR can have white lobes but that's another issue. She's always been tame-ish and bit of a loner, but over the last couple of days (bribed with dried mealworms) she has become quite tame and I rather like it! She's also very vocal and if you talk to her, she "talks" back. This evening, we spend a happy 10 minutes in the garage, with the dogs excluded; I fed her some mealworms and caught her by one leg (!) before lifting her on to my knee. Once there, she sat quite contentedly for a few minutes before heading off quietly on to the straw bale next to me where I was able to stroke her. Until yesterday, we had three RIR in our laying flock. Last night, we had to despatch Mrs Pink. She had been failing for a few days - I don't think she was in any distress, just fading away so we decided that it was time to call it a day. I was conscious of the fact that the RIR were quite old hens, but I wasn't sure how old. This set me thinking about the other hens too, and I realised that my records were quite inadequate and that I had no real record of who was who. Last night, I set about trying to work this out, using and Excel spreadsheet and back entries of the TAS diary. Wow, doesn't time fly when you're enjoying yourself!